So my husband found a book for me off a "free" bookshelf at a coffee shop here in L.A. Here it is. 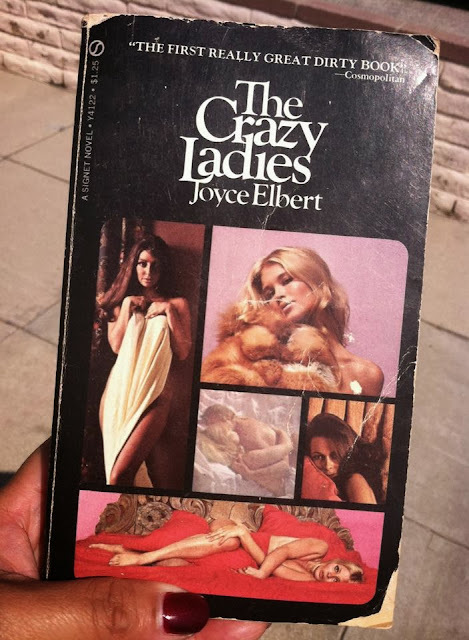 The Crazy Ladies by Joyce Elbert, published by Signet in 1970. They're four crazy ladies looking for a new kind of high....but are they ready for that super-swinging expert in sexual geometry, Robert Fingerhood? But wait! There's one more blurb. I would commit a few felonies for a blurb like that. I am enjoying this book immensely. It's as campy as Valley of the Dolls, but in scope and depth (ahem), it's much more cerebral than a lot of new erotica I've read recently. Let me share a passage I read this morning. Then, toward morning, Robert awakened and started to make love to her again, and somehow it was all intermingled, Robert's hands upon her, Jack's hands upon the controls. They were fused together into one unshakeable grip, and she knew all over again that she should not have gone to bed with Robert out of despair, because the mechanics of physical satisfaction were never enough if the emotional satisfaction was missing. She had learned that from experience. She should have remembered that when you loved a man you brought to bed a quality of exhilaration that was its own exciting reward. It wasn't just what the man did in bed, it was how you perceived him before he did it that made the essential difference. And although Robert was a passionate and tender lover, objectively a better lover than Jack, it was Jack whom she loved, Jack whom she wanted at the very moment that Robert's body was pressed tightly to hers. This right here. This is an essential idea for me as I set up a male protagonist. It wasn't just what the man did in bed, it was how you perceived him before he did it that made the essential difference. Reading this book is enjoyable on so many levels. If you know anything about what happened to Joyce Elbert, drop me a line. I'm fascinated to know more about her.